Pope Gregory XII (Latin: Gregorius XII; c. 1326 – 18 October 1417), born Angelo Corraro, Corario, or Correr, was Pope from 30 November 1406 to 4 July 1415 when he was forced to resign to end the Western Schism. He succeeded Pope Innocent VII and in turn was succeeded by Pope Martin V.
Angelo Corraro was born in Venice of a noble family, about 1327, and was appointed Bishop of Castello in 1380, succeeding Bishop Nicolò Morosini. On 1 December 1390 he was made Titular Patriarch of Constantinople. On 12 June 1405 he was created cardinal and the Cardinal-Priest of San Marco by Pope Innocent VII. He was Apostolic Administrator of Constantinople from 30 November 1406 to 23 October 1409. Gregory XII was chosen at Rome by a conclave consisting of only fifteen cardinals under the express condition that, should Antipope Benedict XIII (1394–1423), the rival papal claimant at Avignon, renounce all claim to the Papacy, he would also renounce his, so that a fresh election might be made and the Western Schism (1378–1417) ended. He became Supreme Pontiff on 30 November 1406, taking the name Gregory XII. The two pontiffs opened wary negotiations to meet on neutral turf at Savona in Liguria, but soon began to waver in their resolve. The Corraro relatives of Gregory XII in Venice and King Ladislaus of Naples, a supporter of Gregory XII and his predecessor for political reasons, used all their influence to prevent the meeting, and each Pope feared being captured by partisans of the rival Pope. The cardinals of Gregory XII openly showed their dissatisfaction at this manoeuvring and gave signs of their intention to abandon him. On 4 May 1408, Gregory XII convened his cardinals at Lucca and ordered them not to leave the city under any pretext. He tried to supplement his following by creating four of his Corraro nephews cardinals – including the future Pope Eugene IV, despite his promise in the conclave that he would create no new cardinals. Seven of the cardinals secretly left Lucca and negotiated with the cardinals of Benedict XIII concerning the convocation of a general council by them, at which both pontiffs should be deposed and a new one elected. Consequently, they summoned the council to Pisa and invited both pontiffs to be present. Neither Gregory XII nor Benedict XIII appeared. Meanwhile, Gregory XII stayed with his loyal and powerful protector, the condottiero Carlo I Malatesta, who had come to Pisa in person during the process of the council to support Gregory XII. At the fifteenth session, 5 June 1409, the Council of Pisa deposed the two pontiffs as schismatical, heretical, perjured, and scandalous; they elected Alexander V (1409–10) later that month. Gregory XII, who had meanwhile created ten more cardinals, had convoked a rival council at Cividale del Friuli, near Aquileia; but only a few bishops appeared. Gregory XII's cardinals pronounced Benedict XIII and Alexander V schismatics, perjurers, and devastators of the Church, but their pronouncement went unheeded. The Council of Constance finally resolved the situation. Gregory XII appointed Carlo Malatesta and Cardinal Giovanni Dominici of Ragusa as his proxies. The cardinal then convoked the council and authorized its succeeding acts, thus preserving the formulas of Papal supremacy. Thereupon on 4 July 1415, Malatesta, acting in the name of Gregory XII, pronounced the resignation of the Pope, which the cardinals accepted. According to prior agreement, they agreed to retain all the cardinals that had been created by Gregory XII, thus satisfying the Corraro clan, and appointed Gregory XII Bishop of Frascati, Dean of the Sacred College of Cardinals and perpetual legate at Ancona. The Council then set aside Antipope John XXIII (1410–15), the successor of Alexander V. After the former follower of Benedict XIII appeared, the council declared him deposed; and the Western Schism was ended. A new Roman pontiff, Pope Martin V, was not elected before Gregory XII's death. Therefore, the Papal seat was vacant for two years. The rest of Gregory XII's life was spent in peaceful obscurity in Ancona. He was the last pope to resign until Benedict XVI did so on 28 February 2013, almost 598 years later. 1 2 " Baynes, T.S. ; Smith, W.R., eds. (1880). "Gregory XII.". Encyclopædia Britannica. 11 (9th ed.). p. 178. ↑ "Titular Episcopal See of Castello". GCatholic. Retrieved 2013-11-24. This article incorporates text from a publication now in the public domain: Ott, Michael (1910). 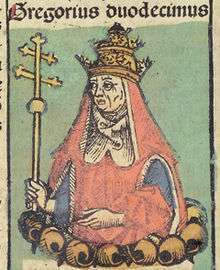 "Pope Gregory XII". In Herbermann, Charles. Catholic Encyclopedia. 7. New York: Robert Appleton. Wikimedia Commons has media related to Pope Gregory XII. Chisholm, Hugh, ed. (1911). "Gregory XII". Encyclopædia Britannica. 12 (11th ed.). Cambridge University Press.